Now that your environment variables have been properly set up, you need to take the final step and prepare your network to call the Autodesk Maya rendering utility. Once it is done, you will be able to render the 3D objects in your Harmony project and preview them in the Camera view in Render View mode. This will allow you to composite your 3D scene and effects. This script starts up a Maya Batch session, renders the 3D elements on that frame, then closes the session. It will open and close the session for every frame to be rendered. This script starts up a Maya Batch session that stays open so that when you render 3D objects through multiple frames, it does not close the session between each of them. 1. Launch Toon Boom Harmony. It is recommended that you run it from the command line, this way, you will have a printout of the process as it renders. Once it is launched, you might also want to display the Message Log view. 2. In the Network view, locate the 3D object module. 3. 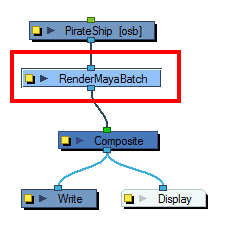 In the Module Library view, select the RenderMayaBatch or RenderMayaBatchServer module and drag it to the Network view. 4. In the Network view, hold the [Alt] key down while dragging the Maya Render module right under the 3D object module to connect it. 5. Repeat the previous steps for each 3D object module in your scene. 6. Save and reload your scene so that Autodesk Maya files can be retrieved from the project folder. 7. In the Camera view, click the Render View button. All the elements of your scene appear in this complete preview of the rendered scene. 8. 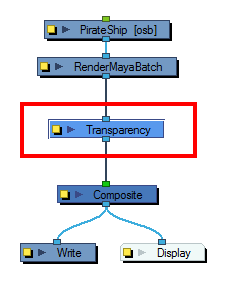 If you want to add effect filter modules to your 3D object, make sure to connect them right under the Maya render module. You are now all set to render your animation project. If it does not render as expected, run Toon Boom Harmony from the command line and see if you received an error readout when clicking on the Render View button. Email this information to support@toonboom.com.